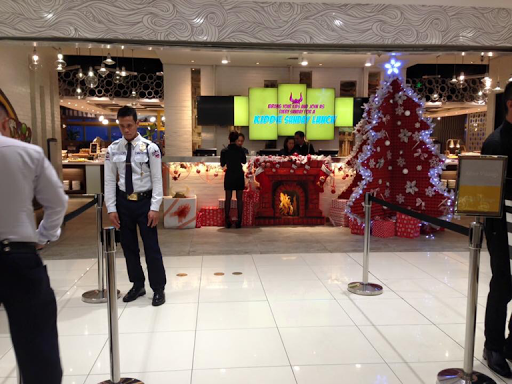 In line with this month's festivity, my partner and I decided to dine at Vikings Megamall. Yipee! You may have dined here for a couple of times but I hope you can bear with my eureka moment *winks* but if you're a newbie like me, let me show you why you should dine here next time. 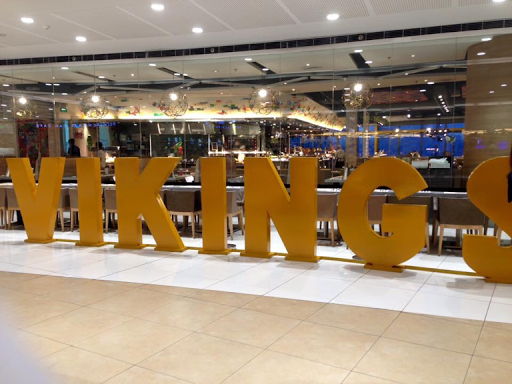 We usually see Vikings Megamall packed with diners inside and walk-in customers waiting outside. 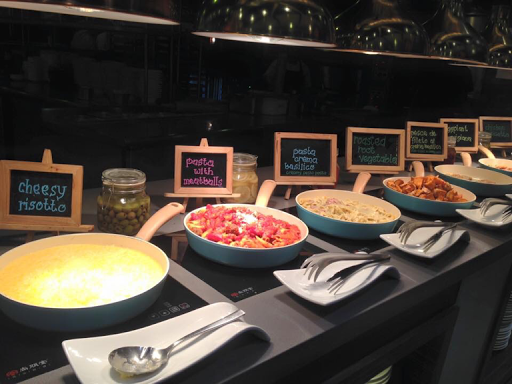 To avoid long queues, we decided to go online for a reservation (Click here). I advise you to do the same since available seats run out fast - so fast that seats get booked up until the very next week. And so we were only able to dine there a week later after boyfriend's real birthday, it's fine though. We'll book early next time. Reservation confirmation at the reception was easy peasy. The staffs are commendable, they are truly nice, super friendly and approachable. They reminded me of The Manila Pen's staffs, literally, high class treatment. 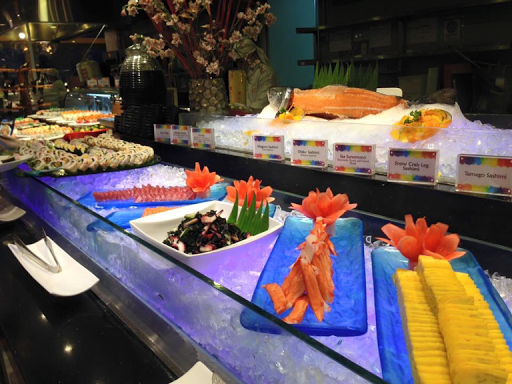 We opted for a dinner buffet (P888 + service charge) since we had to attend a meeting in Global City. We arrived at around 5pm and confirmed our reservation right after. You'll be given a number after which, so be sure to arrive early. 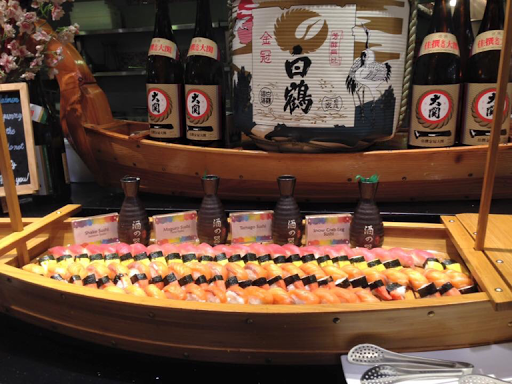 Vikings offers exciting promos especially if you come in groups and if you celebrate your birthday in that day/month. My favorite area of the bunch, Dessert Station. I think it's nice when you're one of the first diners to get inside the vicinity. Since they do not let customers enter inside all at once, the first few customers, including us, not only were able to roam around freely, I was also able to snap some photos while the food styling was still perfectly untouched. I dunno about you, but the OCD in me squeaked like crazy while checking out everything, the food, the chairs, lighting, all in perfect harmony. I kid you not! Station serving mostly cold food - mostly salad, spring roll, etc. From the entrance on the left side showcases Chinese food, different pizzas, and pastas. I truly enjoyed the pizza, and the pasta with meat balls most especially. They even have a DIY Pizza here. Geez, I wish I return and get more from this area. I guess I stuffed myself with too much red velvet slices and other sweets that I wasn't able to try other food. Definitely trying that make your own pizza next time. From the Chinese Station, I liked the Pork Leg which I think will be perfect if eaten with rice. 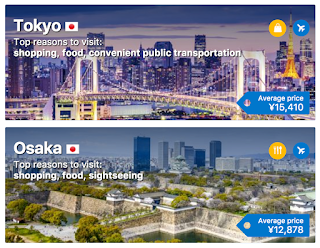 On the right side is where the Korean and Japanese food are served. 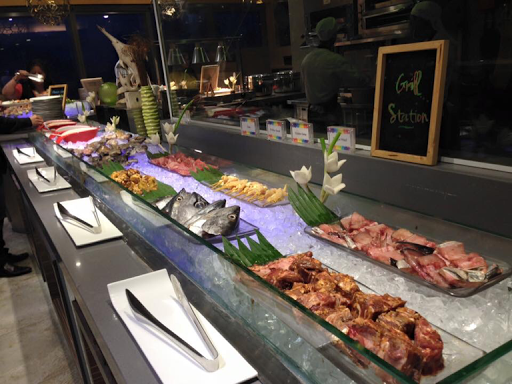 There was also a Grill station where you can choose food like Lamb chops, tuna, or pork to be grilled and be served right on your table. 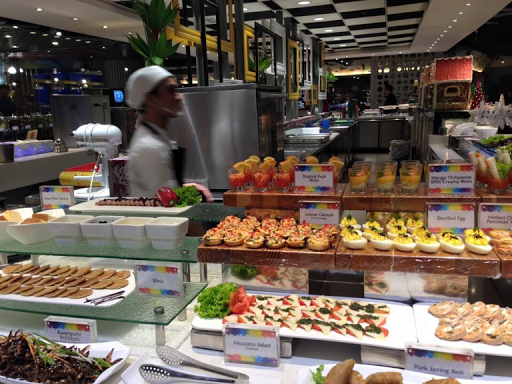 Yep, no need to wait, the staff will do the grilling for you and you can go back to your buffet roaming again. Tadah! Next thing you'll know the grilled food is now on your table waiting for you. 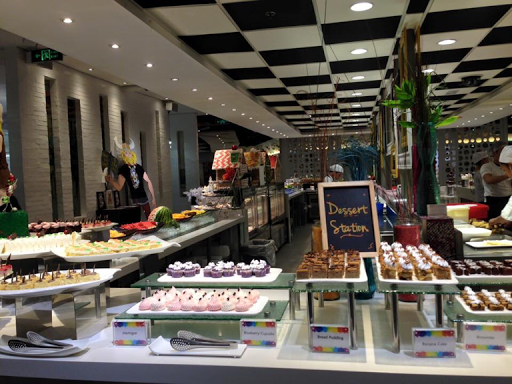 Drinks station is in the middle area in front of Sweets (crepe, ice cream, choco fountain). I think they have at least 8-10 variety of drinks there, I was only able to try one though as I got super addicted to it already - the Lemongrass infused tea, it tasted so incredibly good I would probably still be getting it the next time we dine there. 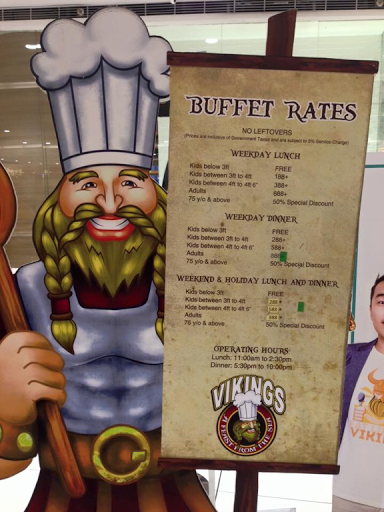 Words cannot express how much I love Vikings' food, and how much I love them even more when I entered their restroom! It was very clean, spacious, no pungent smell, plenty of mirrors for makeup retouching and whatnot. Am I the only one who truly believes that Bubblegum-flavored ice cream is the best thing that ever happened in the history of ice creams? Please tell me you agree. I LOVE BUBBLEGUM (blue) ICE CREAM! When I learned that they have bubblegum ice cream I told myself, "I'm definitely going back!". 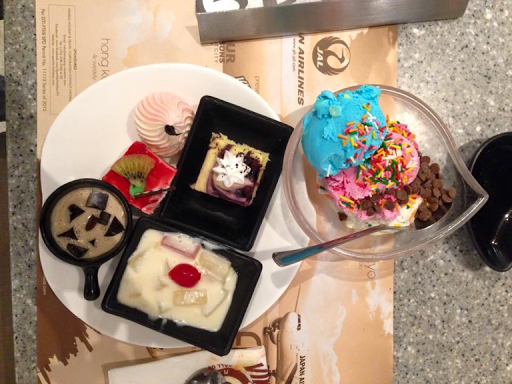 (on the photo: Merengue, Strawberry cake, Coffee jelly, Blueberry cheese cake, Fruit salad, Bubblegum + Strawberry + Cookies n' Cream ice cream combo) WINNER! 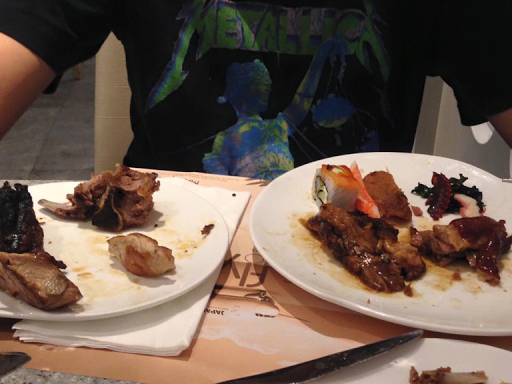 Will I dine here again? Definitely! Would you believe I used to not like concealers? Well, they kind of feel heavy (for me) so I usually just go for them when I'm having a break out or if I'm going out for an evening event that requires heavy makeup. 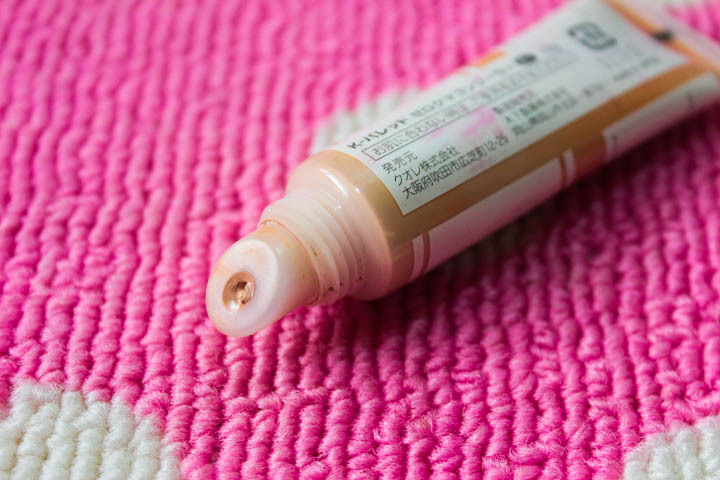 Kidding aside, today's review will be about a korean brand concealer, Missha The Style Under Eye Brightener, it is a tip-type concealer that contains brightening properties to cover up your dark circles and imperfections (Missha). It comes in a tube with a doe-foot applicator, nothing fancy but the applicator is easy to use and helpful. Like most korean BB cream's texture and consistency, Missha The Style Under Eye Brightener leans on the thick yet creamy side and glides on very smoothly. It doesn't dry up insanely quick so application wouldn't be much of a problem. As for preference, I spread Missha The Style Under Eye Brightener using my fingers and then I use a slightly damp buffing brush to blend things away diagonally UPWARD. I'm doing this to give the illusion of 'highlighted' features a.k.a contour. 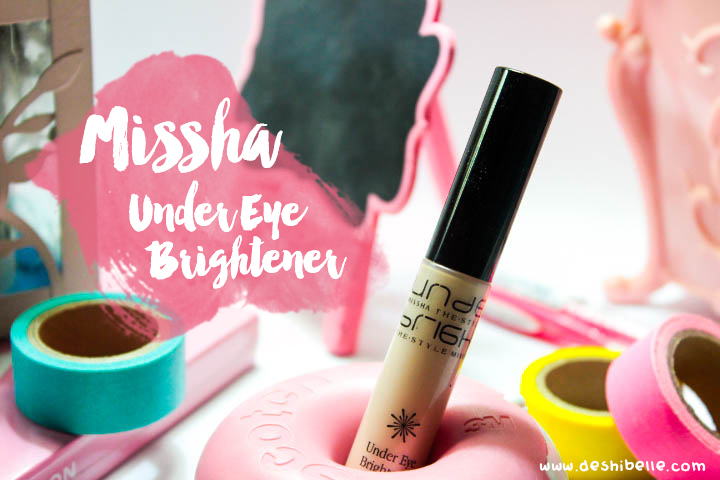 I dunno about you but once it sets, Missha The Style Under Eye Brightener exudes this velvety semi-matte finish that I love. It's not too flat - matte, and not a ball-of-grease kind of glow either. It's just the right mix of semi-matte. 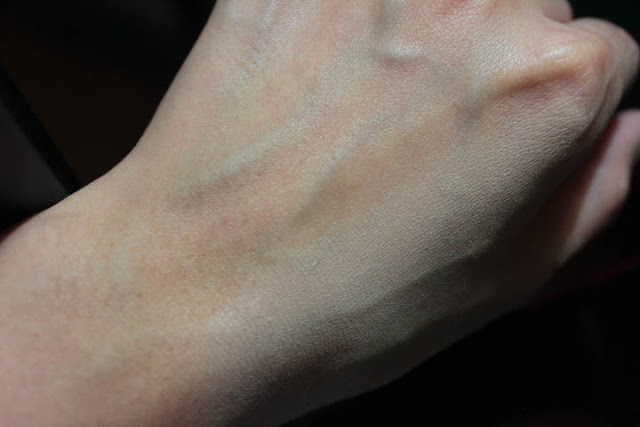 It may not be very obvious on the first two photos due to the lighting, but in reality, there's a stark difference between my true skin color and this concealer's shade. However, since I'm totally acidic (inside and out) foundations and concealers tend to turn a little orangey and darker (on me) and eventually adjusts right to my skin tone. 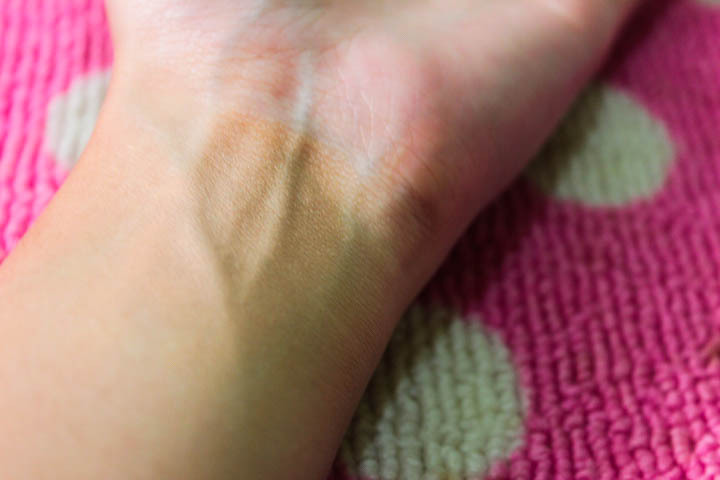 Just take note, due to its thick consistency, this product may not or may settle on fine lines. I only experience this whenever I'm in such a hurry that I wasn't able to properly blend away, also if you have highly sensitive, dry under eye area like I do, do not forget to put on some eye creams before using this to prep and hydrate the area! What I don't like so far? You can get Missha The Style Under Eye Brightener, here! Don’t miss a post! Follow us on Facebook | Google+ | Bloglovin. Anyhoo, Are you basically one of those persons who actually have dry lips all throughout the year? Me too. Summer, winter? It doesn't really matter, my lips are unbelievably always dry and chapped any time of the year too. I was in the province when the last straw of my dry-lips-series totally broke me. Meh. My lips were already bleeding, I could barely eat right, smiling even became a huge challenge, it was downright painful. Next thing I know I was grabbing anything in the grocery that could ease the pain. 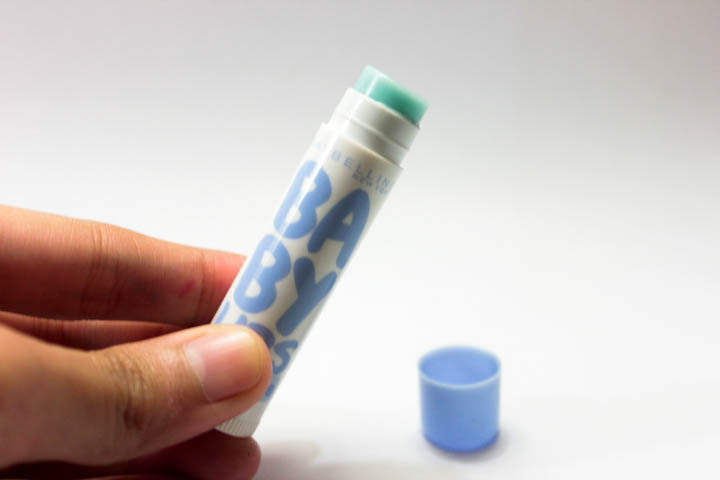 Here is Maybelline Baby Lips Dr. 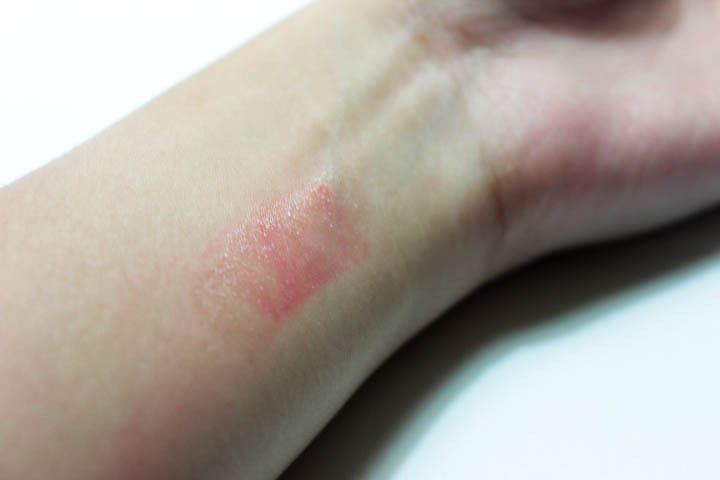 Rescue (P99), it is a pocket-friendly lip balm intended for dry, cracking lips. 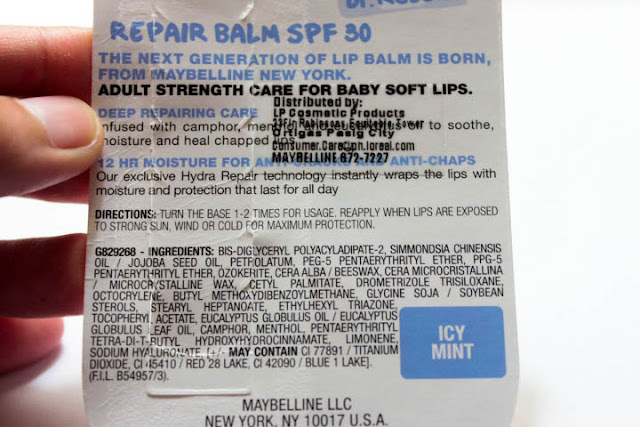 It has menthol, smells like menthol and feels very mentholated too--it's kind of minty and cool on the lips yet it totally didn't hurt my lips even when I have applied it on cracked bleeding areas. Maybelline Baby Lips Dr. Rescue has camphor, menthol, and eucalyptus leaf oil to soothe, moisturize and heal chapped lips. And it promises to zap your problems away within, more or less 12 hours! I was not very expectant of the 12-hour promise, I just wanted to apply anything calming to my lips even just for the meantime. And so I applied some before hitting the sheets, and oh my glob I woke up with no more bleeding and chap! I wish I had a photo of how terrible my lips were before I bought the lip balm. It was so icky and painful to look at that I didn't want to see it myself. So, would I repurchase? Totally! I still get my lips dry once in a while whenever I forgot to re-apply. 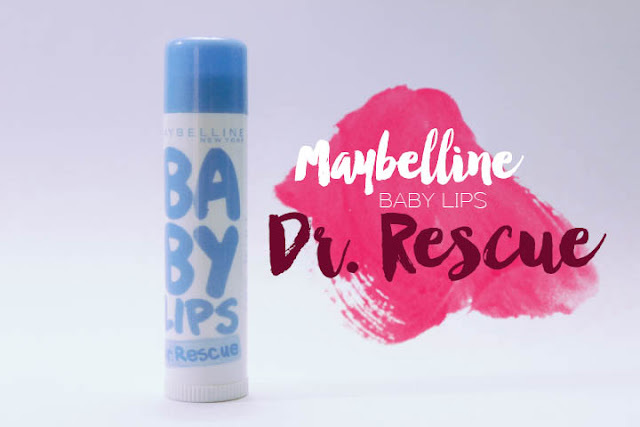 I guess if you have terribly dry lips (like me), reapplying Maybelline Baby Lips Dr. Rescue 2-3 times a day is a must. As for my preference though, I only apply it at night before bedtime as I'm not much of a fan of the shiny effect it gives. Overall, it is indeed a great product considering the price and its performance. You can get Maybelline Baby Lips Dr. 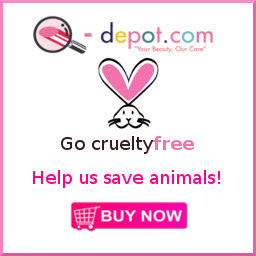 Rescue at Maybelline counters nationwide and at leading grocery stores and drugstores nationwide. 1. 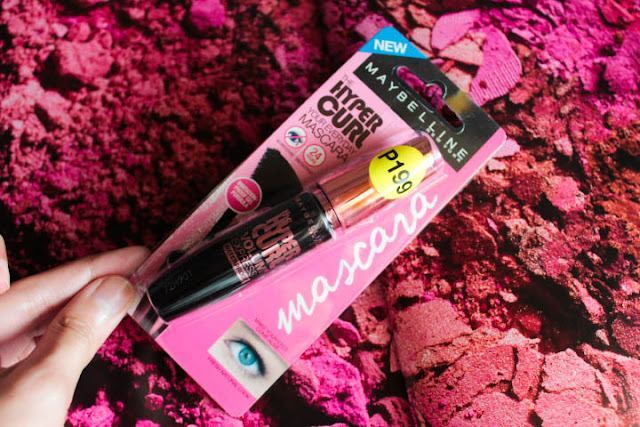 Maybelline Hypercurl Volum'Express Waterproof Mascara comes in a very elegant packaging with black and metallic pink-colored cap and font. It's so sleek and posh you got to show it off in the Ladies' rooms. Kidding! 2. Also, it has this perfectly curve-shaped wand for easy application and control. 3. 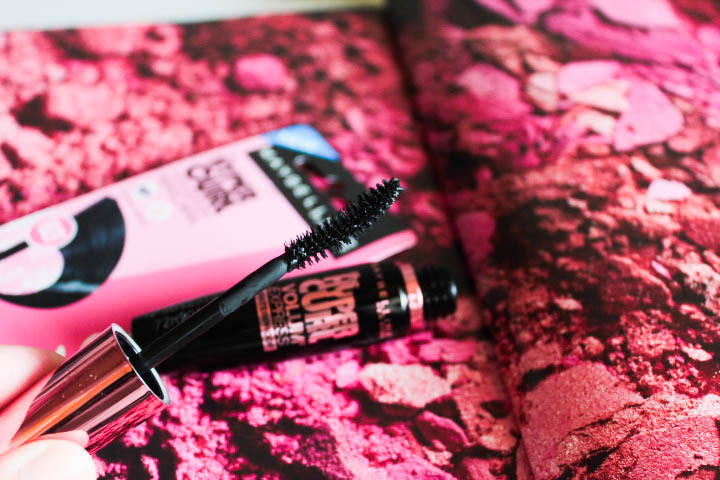 Maybelline Hypercurl Volum' Express isn't only a waterproof mascara but CLUMP-PROOF TOO! Who wouldn't love that? I'm the type of person who likes to layer up mascara, I always work on the illusion of having thick eyelashes because I'm still super afraid of getting lash extensions. 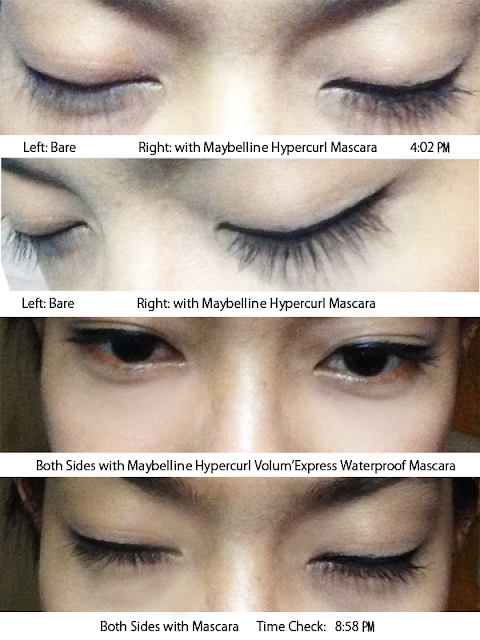 And boy, Maybelline Hypercurl Volum' Express Waterproof Mascara did not disappoint. I would layer it up as thick as I love and it wouldn't clump up! 4. Oh? Did I say waterproof? Yeah, right it's waterproof! Once, I left home early in the morning wearing it, commuted and travelled for roughly 4-5 hours. Hello too much sweating! In the afternoon, I refreshed and washed my face a couple of times and finally took an evening bath--and washed my face with my cleanser. 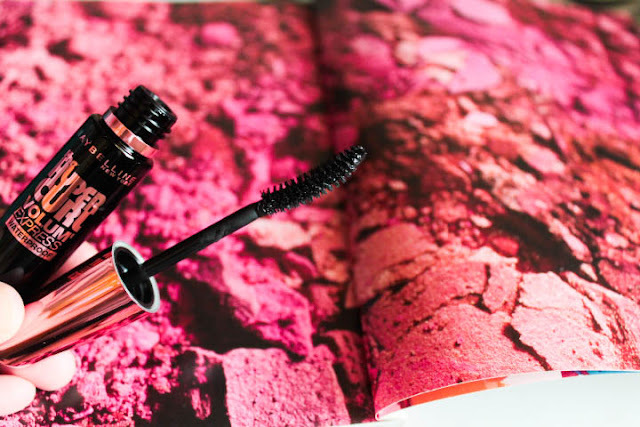 Lo and behold, I can still feel the mascara in my lashes intact thereafter. 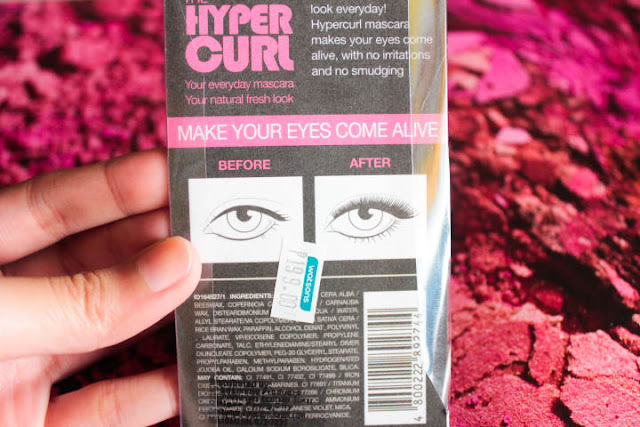 If that's not enough, I also had a facial last week, I went there with no makeup on except for an eyeliner + Maybelline Hypercurl Volum' Express Waterproof Mascara. After all the cleansing, extraction, facial mask (including eye covering) and whatnot, I still came out of the derma with my lashes curled and thick. If that's not being waterproof, I dunno what it is. 5. Lastly, you should get Maybelline Hypercurl Volum'Express Waterproof Mascara because IT'S ON SALE FOR ONLY P150! Yay! 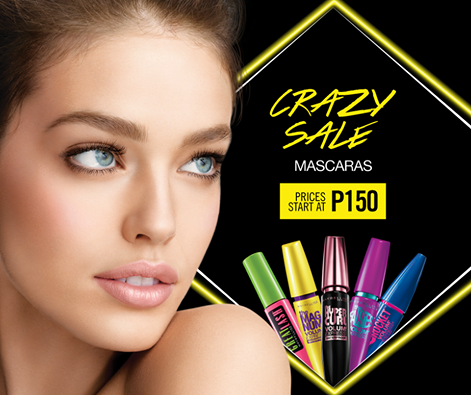 Grab your fave Maybelline Philippines products with prices slashed up to 50% off until Dec. 31, 2015! 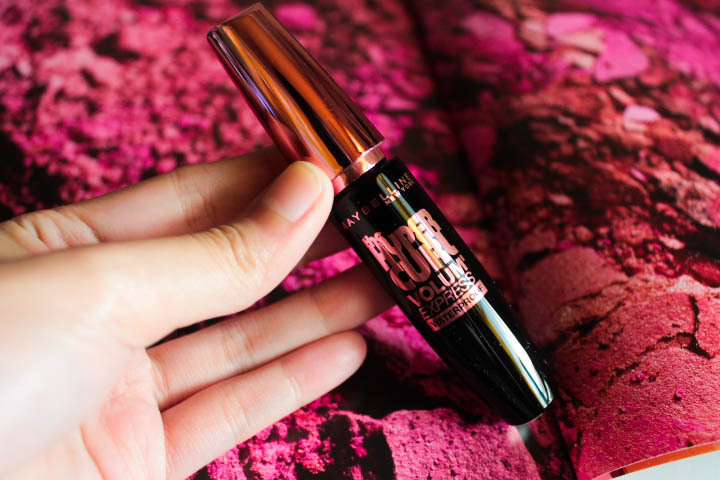 Check out Maybelline Philippines' Facebook to learn more about the products on sale. I can deal with obvious pimple marks here and there, but not with dark circles. Dark circles do not only make you appear older, but it can also make you seem sick and sulky. And sometimes, it can even make you look grumpy and unapproachable too. And we don't want any of that. 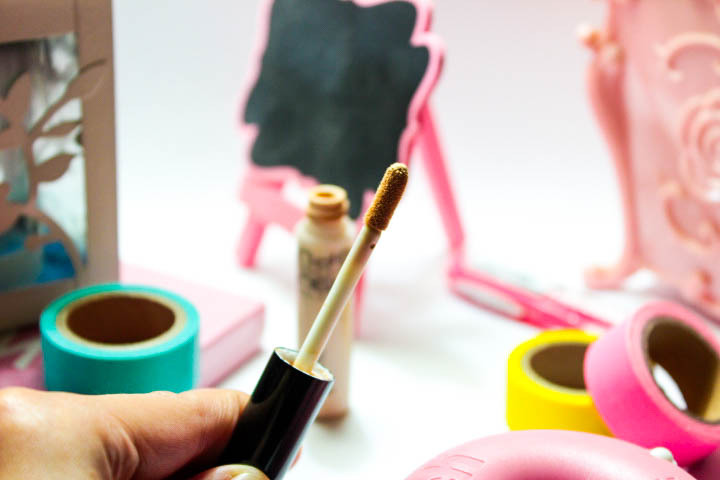 So here's K-palette Zero Kuma Concealer (Php 795) to the rescue! 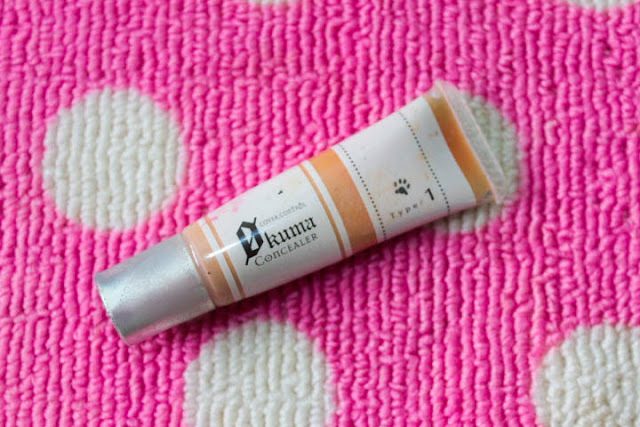 K-palette Zero Kuma Concealer Type 1/Natural Beige is a heavy coverage concealer that can hide the darkest of eye bags. It is housed in a squeeze-tube type container and comes in three variants with different shades and purposes. Each formulated to deal to a particular facial imperfection. 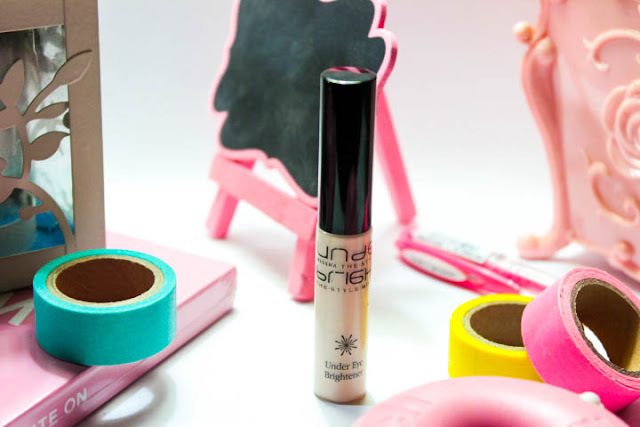 For this review, we have the Natural Beige one (Type 1) which is designed to conceal most dark circles. It is formulated with special hydrating ingredients such as Hyaluronic Acid, Collagen and Rose Water. 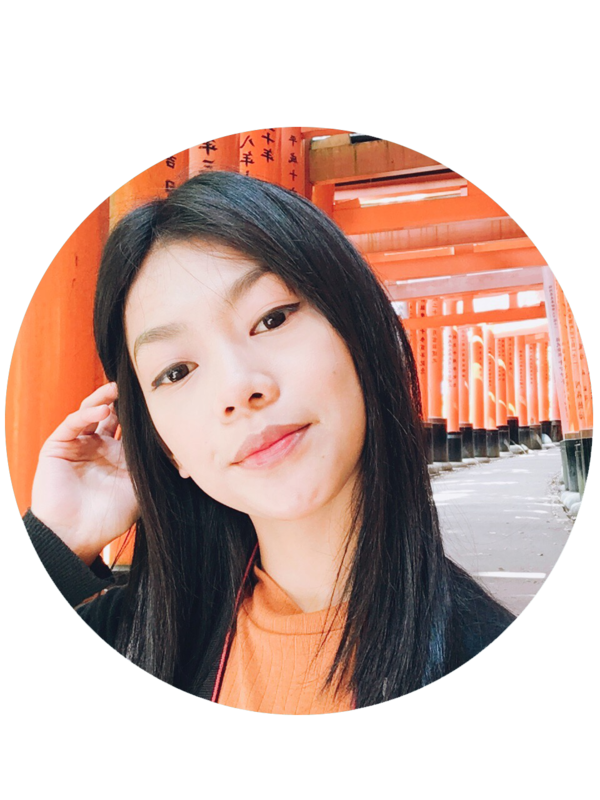 - the shade leans on somewhat yellowish to "salmon" peachy side which does not only suit Filipina skin perfectly, but also compliments the bluish undertone of dark eye circles. (Orange neutralizes and zaps blue). - a little goes a super long way! 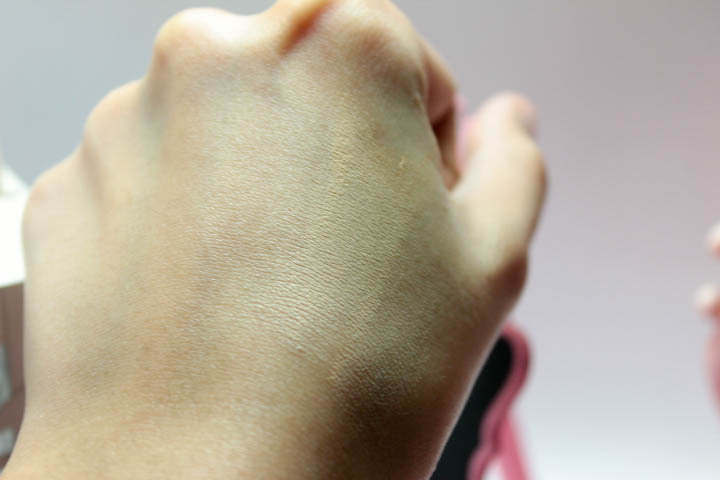 It is highly pigmented and covers pretty heavy, I would say it is comparable to concealers intended for deep scars and tattoo due to its heavy coverage. 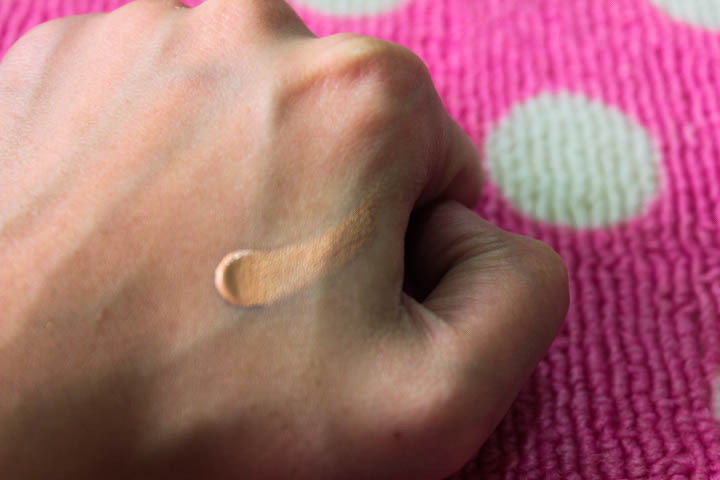 - just because K-palette Zero Kuma Concealer offers heavy coverage doesn't mean it's hard to blend, it's actually very creamy and glides smoothly on skin. Use your fingers when blending and try to work on it faster (but still with precision), to prevent it from looking cakey. - long lasting! It's one of my heavy concealers that last throughout the day even when I sweat or even when I am oily, note that I'm acidic too. It's heavy duty and suitable for a day-long event. - If you have a some dry spots in your face, please do note that they can be accentuated more by this concealer. - if you are the type who's not used to heavy makeups, in this case, heavy concealer, then this is not for you. I can really feel like I have another layer of skin whenever I use this, or maybe it's just me. Ratings: 3.5/5 stars! While it can be rather expensive, it is indeed a good buy considering its performance. If you are a makeup artist or a chic that is always on the go for special events and whatnot, this is the heavy duty concealer that works. Just don't forget to blend things well then you're good to go! :) I got this during my stay in Japan by the way, you can get yours at any Beauty Bar stores (P795) nationwide.